Camp Verde, AZ – Transitioning into a more-active learning community, Rainbow Acres has reimagined its approach to providing educational experiences for the Ranchers by rejuvenating existing programs, creating new job and life skills courses, and establishing a more-structured system that caters to the personal interests, talents and abilities of each Rancher. In short, Rainbow Acres has raised the bar for educational experiences. Following an extensive planning process, the new Rainbow Academy has been launched with the Education Team in place to provide necessary support for a new approach to providing educational experiences. Rainbow Academy is offering a wide-ranging curriculum that includes enhanced Music Therapy options, Animal Science and Horticulture activities, Fine Arts and Practical Arts programs, and new Job Skills and Life Skills courses that stem from Project Discovery, a nationally-renowned vocational training program designed for adults with developmental disabilities that has been used in over 5,000 school and non-profits. “This is a paradigm shift for Rainbow Acres,” Gary Wagner, President and CEO, said. “In terms of how we view the Ranchers, Rainbow Academy will ensure they’re treated as active learners who have a strong desire to pursue their goals and interests.” In early September, the Ranchers voted in a campus-wide election to select the name of this new initiative. They chose ‘Rainbow Academy’ based on how it reflects the new, more academic nature of learning through Rainbow Acres’ courses, activities and experiences. The seed for Rainbow Academy was planted in the summer of 2017 when Jen Murphree, Director of Admissions, initiated a discussion with the executive team focused on unifying Rainbow Acres’ array of educational offerings and implementing Project Discovery as a program she knew could be successful. “Project Discovery has a great reputation among non-profits that serve adults with developmental disabilities,” Murphree said. “I knew that it could really make a difference in preparing our Ranchers for living together and working on and off the ranch.” Also, Tim Hagan, CEO of Education Associates, the creator of Project Discovery, visited Rainbow Acres several months prior, and shared information that was helpful for researching their curriculum. Alongside these developments, two Rainbow Acres educators were exploring new ways to teach Ranchers, abandoning “rote learning” in favor of providing more intellectually-stimulating challenges. Rodolfo Morales, Horticulture Educator, and Lisa Page, Animal Science Educator, established new courses that engaged the Ranchers as active learners and encouraged them to work to their greatest potential. Wagner was amazed by the results, leading to the new direction for all educational experiences at Rainbow Acres. Morales had established courses in which Ranchers research scientific topics, then develop presentations they provide live to their classmates and Rainbow employees, and during events like Family & Friends Weekend. Page focused her courses on interactive learning related to horses and other animals on the ranch including a miniature Mediterranean donkey; African dwarf goat; guinea pigs; and “guest animals” on occasion. These trends came together in 2018 to shape the executive team’s thought-process relative to Rainbow Acres’ appeal to current and new Ranchers. “Many prospective Rancher families have higher expectations for programs that more effectively prepare their loved one for gaining experiences in the larger community.” Murphree said. “The creation of Rainbow Academy is a direct response to meeting these heightened expectations.” New donations for the acquisition and implementation of Project Discovery were generated through special events, foundations and personal gifts. In addition to Morales and Page, Rainbow Acres also benefits from the service of Education Team members Rolene Dugi, Rancher Services Coordinator; Andy Rogers, Vocational Educator; Mitch Koonce, Religious Life Coordinator; and Michael Redhawk and Marlys Mallét, artists and Fine Arts instructors from Sedona with over seven years of volunteer service. Within months, Wagner added several new team members: Catherine Metz, Life Skills Educator; Eric Jennings, Music Educator; and Lu Anne Behrle, part-time Computer Science Educator. What’s more, all of the new hires were within the budget, including the salary anticipated for the Project Discovery courses. At the same time, the summer of 2018 also provided a golden opportunity to renovate Rainbow Acres’ Life Long Learning Center into a new adult education facility to be named the Worden Taber Center. The building was renamed by the Education Team in part to emphasize that learning takes place throughout the Rainbow Acres campus. “The Wordens and Margie Taber were personal and professional friends for over 30 years,” Wagner said. 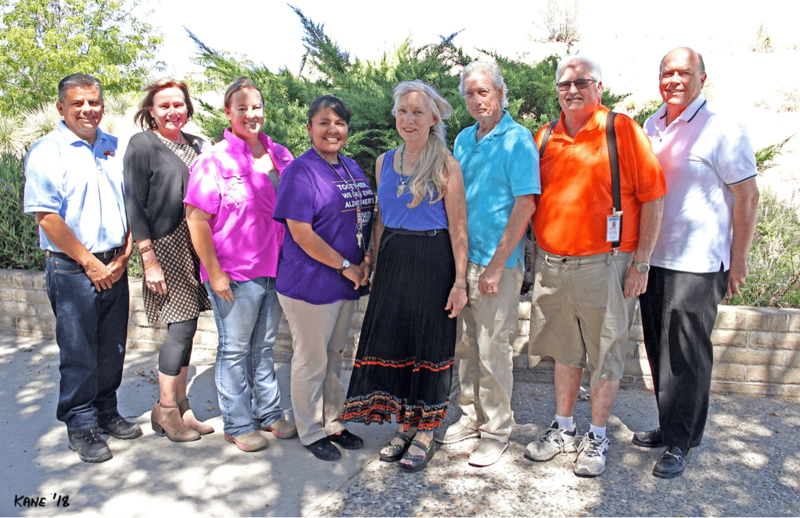 “They cared deeply about Ranchers learning, growing and thriving. And they were both generous benefactors to the program and facility that now bears their names.” This major renovation will enhance the classrooms, computer lab, media library, office space and restroom facilities. The renovation also includes installation of more-efficient HVAC, lighting and appliances. Through Rainbow Academy, each quarter Ranchers will select their own courses and activities, and assemble a weekday schedule with the Education Team. Each weekday will be divided into five course periods with breaks in-between. A typical day can include a Life Skills course, an Animal Science experience, our Fine Arts program, attending Choir practice, and more. Our educators will work alongside the Ranchers, guiding their progress as active learners, utilizing interactive lessons, video segments and other methods to provide the Ranchers with a flexible and engaging learning experience. Rainbow Acres’ Education Team includes (from left) Rodolfo Morales, Horticulture Educator; Catherine Metz, Life Skills Educator; Lisa Page, Animal Science Educator; Rolene Dugi, Rancher Services Coordinator; Marlys Mallét and Michael Redhawk, Fine Arts Instructors; Mitch Koonce, Religious Life Coordinator; and Eric Jennings, Music Educator and Rancher Choir Director. Not pictured: Andy Rogers, Vocational Educator; and Lu Anne Behrle, Computer Science Educator.